Then He said to them, “Do you not understand this parable? How will you understand and grasp the meaning of all the parables? This last week my husband and I attended a potluck dinner at the local church for a young couple who will be moving from the community to Italy, as the husband fulfills part of his military service. Although I am not a member of this church, I love so many of the people who are, and recognize them as faithful and obedient Christians. I overheard my husband, who is continually challenging himself and fellow Christians to understand their Bibles at a deeper level, ask a young woman, "Tell me, do you think there is a difference between the Gospel of Jesus and the Gospel of the Kingdom"? This young woman loves a good challenge and promised to get back to him after studying the matter. But that got me to thinking ... How many Christians have even considered this question, or better yet, care enough to determine an answer for themselves? Although I believe there is a difference and could give a pretty good apologetics argument for my opinion, I am never satisfied with my level of knowledge. So I decided to dig a little deeper to try to understand these two concepts and found that the Parable of the Sower is at the foundation of understanding the Gospel of the Kingdom. In fact, the questions Jesus poses in the title of this blog are questions He asked after He taught His disciples this parable, and He makes it pretty clear that if we don't understand the parable of the Sower, then we will have trouble understanding all the rest of the parables. Wow! I had never grasped that concept before! Understanding this teaching is something worth pursuing. I want to begin by saying that I spend a lot of time in my Bible, studying for myself, but there are also good teachers in this day that I admire and respect; teachers who are following in the footsteps of teachers down through the centuries: Origen, Matthew Henry, Dwight Moody, Dietrich Bonhoeffer and Billy Graham. These historical figures are flawed men, and you may not completely agree with their theology, but you cannot deny their passion for the Gospel. The same is true of men that I admire today: Justin Faull, Russ Dizdar, Michael Heiser, and Dan Duval. In fact, it was a podcast of a sermon Duval delivered for his online ministry, The Fire Place Church, that helped me come to a new level of understanding regarding the Parable of the Sower and the Gospel of the Kingdom. We are all familiar with this parable ... chronologically, it is the 11th of 49 parables that Jesus taught. It is important to understand the order in which Jesus taught them, and what came before this parable if it, indeed, is the one that understanding all the other parables rests upon. Parables 1-10 focus on the fact that there’s a new story being told, that it’s not to be hidden, and it serves as a foundation for what’s coming next. These are the parables which involve new cloth, new wine, a lamp on a stand, wise & foolish builders, the moneylender who forgives unequal debts, a lamp on a stand (2nd time), a rich man who builds bigger barns, servants who must remain watchful, wise and foolish servants, and an unfruitful fig tree. The 11th Parable, the one about the Sower of the Seed, teaches us to understand the foundation of what's coming next ... the Kingdom of God. The parable relates the familiar story of a sower who sowed seed on four types of soil: the wayside (or the hard road), where it failed to take root and the birds ate it up; on rocks where there was not much soil, although a plant sprang up and was quickly scorched by the sun because the roots had no depth; among thorns, where the seed took root, but the thorns grew up and choked it, and it yielded no fruit; and the good soil, where the plants grew, and increased, and yielded 30, 60, and 100 times what was sown. How many of us have been taught that the primary purpose of this parable is to point out that it was only the good soil where the seed grew and yielded fruit; that this parable is all about the salvation of those people who occupy the good ground and their response to the Gospel of Jesus Christ? Yes, Jesus goes on to explain that the Sower "sows the word [of God, the good news regarding the way of salvation]". But if you re-read the parable, you will notice that all the types of soil but one received the Word and had an initial experience of salvation. Jesus tells us that the seed that fell on the rocks represent those who "receive it (the Word that brings salvation; the Gospel of Jesus Christ) with joy [but accept it only superficially] -- but accept it they did! -- and they have no real root in themselves, so they endure only for a little while; then, when trouble or persecution comes because of the Word, immediately they [are offended and displeased at being associated with Me and] stumble and fall away". He tells us that the seed that fell on the thorns are "the ones who have heard the word, but the worries and cares of the world [the distractions of this age with its worldly pleasures], and the deceitfulness [and the false security or glamour] of wealth [or fame], and the passionate desires for all the other things creep in and choke out the word, and it becomes unfruitful". They were still saved, but they fall away and are unfruitful! Lastly, He tells us that the seed that fell on good soil represents "the ones who hear the word [of God, the good news regarding the way of salvation] and accept it and bear fruit—thirty, sixty, and a hundred times as much [as was sown]." I can just hear all my Baptist friends! "Only the seed that fell on the good ground represents the truly saved! The seed on the rocky and thorny ground represents those were were never really saved!" I will agree to a point ... they experienced salvation, but did not keep it. But stick with me -- I do not believe this is the point of the parable. We all understand what the Gospel of Jesus Christ is; Gospel means "good news", and the "good news" of Jesus Christ is that He died for our sins to save us from the hell we deserve. BUT, is that what He is preaching in this parable? Jesus hasn't died yet, so how could He be preaching how His death, burial, and resurrection would lead to eternal life? No! When asked to explain the parable of the Sower by the disciples, Jesus said, "“The mystery of the kingdom of God has been given to you [who have teachable hearts], but those who are outside [the unbelievers, the spiritually blind] get everything in parables...". He did not say, "the mystery of the Gospel of Me has been given to you." Can you see that He is trying to tell them (and us!) that the good news is more than the Gospel about Him; it is about the good news of God's kingdom! This parable is not only about the salvation experience of hearers of the Word -- it's more than that! Our salvation experience is just the beginning of our purpose here on earth. This parable is about understanding the mystery of the kingdom of God --- if we have teachable hearts like the disciples! Jesus wasn't preaching his death, burial and resurrection with this parable. He was preaching something else, something bigger than Himself. He was preaching about the coming of the kingdom of God, the Gospel of the Kingdom. But what is that? The kingdom of God is the realm in which God exists; it is wherever God is. And what does a King do? He governs His subjects and servants. The Gospel of the Kingdom is the good news of God's government. It is the good news that God governs out of His realm, which is now dimensionally separated from the earth, and that He intends to govern the earth through us; to interact with us in order to transform the planet to His will in accordance with the faith and belief of His people. Up to this point, God's government has been a spiritual government. But when God became incarnate, in the figure of Jesus, His government was now interacting through a man on earth, and He was taking territory from the Enemy. That is "the mystery" of how God would now govern the earth, and it was good news for mankind! Can you see that the Gospel of the Kingdom goes so much further than the Gospel of Jesus Christ? Please understand -- I am not diminishing the Gospel of Jesus Christ! It is the key to the salvation message by which all men can avoid eternal damnation. It is the necessary first step! But let's not stop mid-sentence! Let us not diminish the Gospel of the Kingdom which tells us the good news that God can now interface with saved men through dimensions, and can work with us to begin bringing heaven and earth back into alignment! At the heart of the Gospel of the Kingdom is the knowledge that Jesus was the first man to manifest this interface, and then He turned around and gave that ability to us ... whoever believes in me will do the works I have been doing, and they will do even greater things than these, because I am going to the Father. He is telling us that the Father gave Him authority to help govern the earth (to do God's will), and now we can, too, because He is going back to the Father and will be personally interceding for us; interfacing through the dimensions with those who believe in Him. Can you see that when we stop at the salvation message of the Gospel of Jesus, we lose out on a bigger revelation? It is through the revelation of the death and resurrection of Jesus that we gain access to the dimension and realm where God is King. So to bring it full circle, I believe this is what we need to understand about this parable: Three out of four of the types of ground, or soil, received the seed; they were saved. But not all experienced the same thing over the long haul. It had to do with the state of the ground upon which the seed fell. So what does the ground represent? Remember, when asked by the disciples what the parable meant, He told them the mystery of the kingdom of God has been given to those who have teachable hearts. Can you accept that perhaps that the ground represents the condition of our hearts; our belief system and where our faith is anchored? Can the different types of ground represent our willingness to connect to the realm of God, and to becoming partners with Him to govern the earth. The Kingdom of God (where God resides and governs from) works with our human hearts (belief system and depth of our faith). But when the world challenges us through its problems -- bills that are due, family issues, health threats -- we choose fear instead of faith. And fear closes that inter-dimensional connection. Once we have received salvation, we are each responsible for our own heart condition. 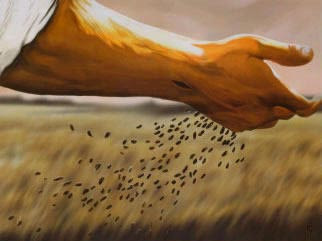 Jesus is sowing Himself into our hearts. How hard will we work to grow our roots deep; how hard will we fight to keep our roots from being choked out by the world? How teachable is your heart, and how much do you want to work with God to help govern His earth? The extent of your ability to do that, as a saved Christian, depends on the condition of your heart -- is it hard, rocky, thorny, or good? Think about it. Good morning ,Wow and thank you,\I have been taught and read and studied the Word since I was little kid and I never was shown this in a direct teaching.I have come to an understanding of it thru prayer and H.S leading. The idea of two sets of steps so to speak .The dedication of our spirits to Christ and then the lifelong journey of walking out His life in us as a separate step.Sort of.Truly thank you for this teaching.I believe it will make it easier in sharing the Gospel to those new in Him. I want to thank you so much for your sharing of your study of these things as I know the Lord has been leading me on but as my eyesight has gotten worse its harder to read from my Bible and its easier to read on my computer and share the teachings that Im sent to. Michele, I praise the Holy Spirit for leading you to a greater understanding of the concept of salvation. I agree, I believe that our act of accepting Jesus as our Savior is just the first step in our salvation process. Our "being saved" is a life-long journey and won't be completed until we see Him face-to-face. I have had it explained to me like this ... when we accept Jesus into our heart, it is like stepping into the foyer of a great mansion. There are lots of halls and rooms to this mansion and we will be visiting each one, as He draws us closer to Himself. At our initial salvation experience, we are only standing in the foyer! We must then study the Word, partner with the Holy Spirit, and abide in Jesus as we grow and mature in our faith. One has to wonder how many Christians are still stuck in the foyer? Thank you for throwing down this challenge to all Believers. It always gives me great hope when I meet a fellow Christian who understands why Jesus said He taught in parables: "Though seeing, they do not see; though hearing, they do not hear or understand." You, my friend, have obviously taken the time to do your research and truly "see" what Jesus is trying to teach us. And thanks for the suggestion to write about our authority and power, crowns and inheritance. I agree -- too many Christians do not understand these concepts. I hope you keep commenting! BR, Oh Im gonna keep commenting! Awesome teaching on parable and the kingdom of God.we in this country do not understand the role of a king and the role of His subjects (servants,friends,and even children)which we are all.We are to honor the Kings commands,and since we have such a great ,loving, merciful King who rescues us from the opposing enemy and gives us the honor and ability to fight with him, it should be easy for us to do this.makes me think of the mercy david showed and how the people loved him.if we are to be saved just to go to heaven,then God wouldnt seem to love us by keeping us here in this wicked and evil world.We have been set free (as isrealites in egypt)to serve,represent,and fight ,andon behalf of our King for his due glory.what an honor!may we fight now and can speak of our battles(triumphs and defeats)when we leave this battlefield and come home to our hea enly family.I THANK GOD FOR REVEALING HIS WORD THROUGH YOU.THANK YOU HOLY SPIRIT FOR TEACHING THOSE WHO DESIRE TO PLEASE YOU. I can just feel the Holy Spirit upon you! And, yes, this message of the Kingdom of God seems to be absent from the modern of Church. We seem to be stuck on the salvation message, when in reality, that is a part of the bigger message -- that God wants to work through us, His representatives here on earth, to bring about His government... ON EARTH AS IT IS IN HEAVEN! You have expressed this idea as well as anyone I have seen! Thank you so much for taking the time to comment and enrich our understanding.